The instructions presented in the following booklet were transmitted by the Master Jesus Christ Himself, during a praying retreat realized by members of the Grace Mercy Order in one of its monasteries in Uruguay, during Holy Week of 2012. Christ presented Himself during the groups work, as had occurred at other times1. For seven consecutive days He conducted the group through a very important work of prayer for the souls and for the planet2. The Orandium of the Passion and Transfiguration of Jesus is a sacred instrument of prayer for these times. We have transcribed the words of the Master as He transmitted them. With this Orandium you will be calling, in My Name, at the door of My Heart, at My Temple, at My Essence and thus you may relieve the burden of My Heart for so many injustices that the world sends Me. 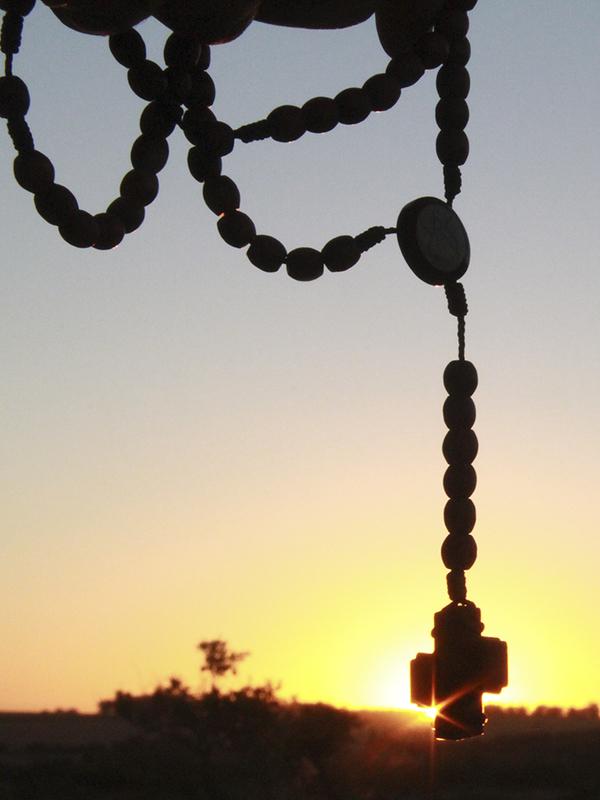 My Love will radiate to those who pray these beads with Me. You must pray for the world on each Saturday and Sunday with all of your brothers and sisters of the path. You must spread this key of redemption to the world in these times of tribulation. Each prayer that I am delivering to you is a decree of My Love; they are attributes of My Resurrection, which you must honor and glorify from this moment on. Have pity on us, Lord. At the 1st big union bead, as at the other big union beads, we pray The Prayer of Our Father in Aramaic. In total we pray 81 beads. As we do the Orandium practice, let us keep present in our hearts the value and the gift that is being delivered to us and how reverently we must use it. As we said, in the union beads of the Orandium of the Passion and the Transfiguration of Jesus, The Prayer of Our Lord must be pronounced in Aramaic, following the sounds presented in the transliteration. So that we may understand what we are pronouncing, we have presented a possible translation for this prayer, considering that as other sister languages – as Hebrew and Arabic – Aramaic may express different levels of meaning. May Your sublime and profound light be lived. in the Universe5 as on the earth6. as we free the sins of the others. and renews itself from epoch to epoch. Affirming in trust, faith and truth10. 1 See the book “Cristo de la Luz, Samana Redentor” (Christ of Light, Samana Redeemer), by Mother María Shimani de Montserrat, Irdin Editora. (Spanish and Portuguese only). 2 More extensive and detailed information concerning the Orandium of the Passion and Transfiguration of Jesus may be found in the book “Siete días con el Maestro Jesús de Nazaret” (Seven days with the Master Jesus of Nazareth), by Mother Shimani, Irdin Editora. (Spanish and Portuguese only). 3 It refers to the side of the chest, at the height of the chest. 5 In all that vibrates. 6 That which is material and dense. 10 I confirm it with all my being.